sector, the corporates are not able to repay their loans and their debts are increasing at an alarming level. And therefore, corporate sector have no other option other than to cut back investments. This creates a balance sheet problem in both public sector banks (PSBs) and corporate sector and, it has been seen as a serious obstacle to investment and growth desires of the country. sector, the corporates are not able to repay their loans and their debts are increasing at an alarming level. And therefore, corporate sector have no other option other than to cut back investments. Till June 2016, the total Gross Non-Performing Assets (NPAs) for public and private sector banks is around Rs. 6 lakh crore. And this figure is increasing day by day. But the Economic Survey 2016-2017 gives an effective solution for NPAs and called for a need to set up an Asset Reconstruction Company (ARCs) owned by the Indian Government. This ARC will be known as Public Sector Asset Rehabilitation Agency (PARA, also dubbed as a Bad Bank), it can be seen as an attempt to resolve India's twin balance sheet problem. 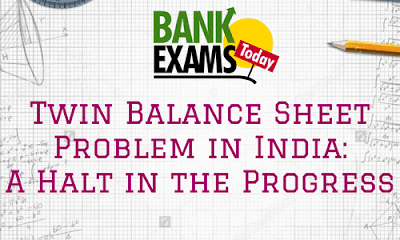 There are some other solutions acknowledged by the RBI for twin balance sheet problem, such as Strategic Debt Restructuring (SDR), Asset Quality Review (AQR), Sustainable Structuring of Stressed Assets (S4A) which can heal PSBs from their bad loans. Also, RBI has set March 2017 as the deadline for Indian Banks to clean up their balance sheets. Last year, Union Budget also allocated Rs 25000 crore towards recapitalisation of Public Sector Banks. This was a necessary step to infuse capital into the Public Sector Banks. An asset reconstruction company is in the business of acquiring Non-performing assets (NPAs). The Banks and an ARC get into an agreement in which the ARC take over the NPAs from the Banks Balance Sheet at a certain amount, lower than the Book Value. After this process, the particular ARC try to recover this amount from the borrowers. A bad bank is solution to segregate NPA's from a bank's core business. After the bad assets are removed from the balance sheet, the bank can start its loan business again. The solution of NPAs lies in the fact that the bank will earn enough interest from new good loans to cover the losses from the bad loans it made earlier.